Click here to visit the Tic Tac facebook and like them. Then on the “Shake It Up” tab, click “Click here to continue” and fill out the form to enter their sweepstakes. After you choose the grand prize that you’d like, scroll down and click “click here to play the instant win game” to see if you’re a winner. There will be a total of 406 winners (6 sweepstakes and 400 instant win). You can enter this one daily through August 4th. 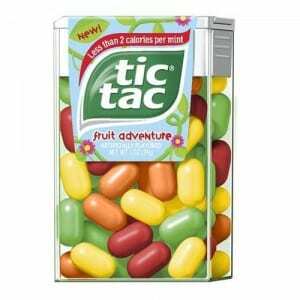 100 Prizes – One (1) month supply of Fruit Adventure Tic Tac mints (awarded as twenty-four (24) packs).